This winter is shaping up to be a great snowy owl irruption year. Ryan Brady with the Wisconsin Department of Natural Resources estimated there are at least 225 snowy owls in Wisconsin this winter. In a typical year, Wisconsin sees a couple dozen snowy owls, so finding ourselves in a snowy flurry is just delightful! Snowy owls are among the two or three species at greatest and most immediate risk from climate change, yet we know relatively little about their ecology during migration, and why they're here in human-dominated landscapes (read more about the snowies at Goose Pond in our December 15, 2017 FFF post). We’re honored to work with Project SNOWstorm again this winter to study snowy owls in a really cool way: using a backpack transmitter. Through data collected by Goose’s and other snowies’ transmitters, Project SNOWstorm has documented little-known and surprising aspects of snowy owl ecology and behavior, traced their migrations in unprecedented detail, and delved into their health and the risks they face from environmental toxins like mercury. Project SNOWstorm has also partnered with federal wildlife agencies and airports to find better ways to keep airplanes and owls safely apart. They published a paper in 2017 showing trends in the habitats used by tagged owls. With this winter’s snowy owl irruption, Project SNOWstorm was once again looking for owls in Wisconsin on which to place transmitters. 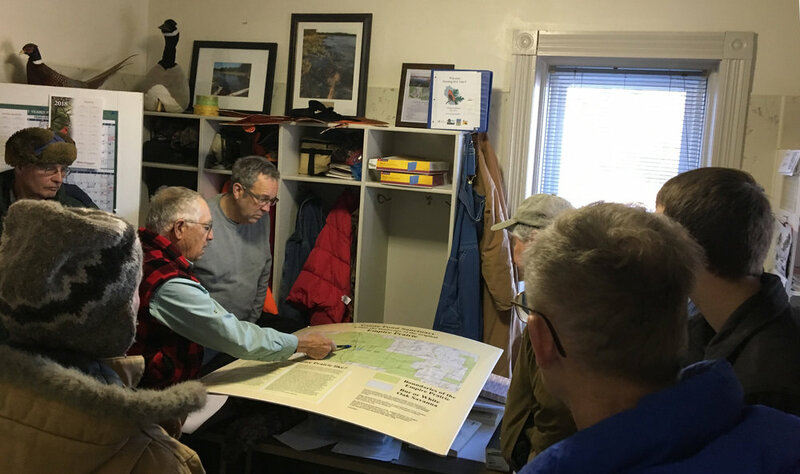 With three owls around Goose Pond Sanctuary, Madison Audubon Society stepped up and volunteered to help trap owls and raise $3,000 to cover the cost of a transmitter. If you want to help with the cost of that transmitter, please donate today! The process was quite the rollercoaster. On December 14, the snowy search crews assembled. We received a phone call tip that a snowy owl was seen near Goose Pond’s Sue Ames Prairie just before the banders and volunteers arrived. However, after 90 minutes of extensive searching, attendees were disappointed to find not a single owl, snowy or otherwise. We were skunked. Goosed. Snowied. But, owl trappers are a persistent group and Gene, Tom, and Rick, along with more volunteers tried again on January 4. Hopes were again high. One owl had been seen the night before along Highways 51 and K and another was seen near Highway K and Goose Pond Road. Tom and Rick arrived in early afternoon and we immediately headed out. By 1:30 p.m. we found the owl near Goose Pond Road sitting in a large bare field. This particular bird waited patiently in the field for the next several hours until our owl scouts and trappers were assembled into teams and sent off to both keep an eye on the owl we'd already seen, and look for another one. Maddie with team members Matt Reetz and David Rihn, and Sue with team members Monica Hall, Janet Flynn, and Greg Tiedt, parked just off of Hwy K where they could watch the owl's movements, and potentially take off after it if need be. Mark and others searched with Gene for additional owls. Gene was spot on when he said, “humans are the least patient animal on the planet.” Watching and waiting for a snowy owl to move, you quickly realize just how patient most animals, particularly predators, really are! It wasn't until about 4:30 p.m., just as the shadows lengthened enough to finally cast a pall over his bright feathers, that the owl finally flew to the top of the gravel mound in the quarry. Tom and Rick had already set up a cage holding two starlings as bait. We waited in great suspense until suddenly a University vehicle came down the road by the quarry, and the owl flushed to a nearby fence post. The owl knew the starlings were there, but it was far more cautious after that! For the next 30 minutes, Tom and Rick noted that the owl would land on the ground next to the trap and walk around and around, looking at the starlings, considering what to do. Gene was summoned to the quarry to help, and he was getting ready to try and trap the owl with a bow net. Right about this time Mark called and reported that he and Brad Zinda, a wildlife student from UW Stevens Point, found another snowy sitting on a utility pole in the front yard of a house nearby. It was nearly 5:00 and getting dark. 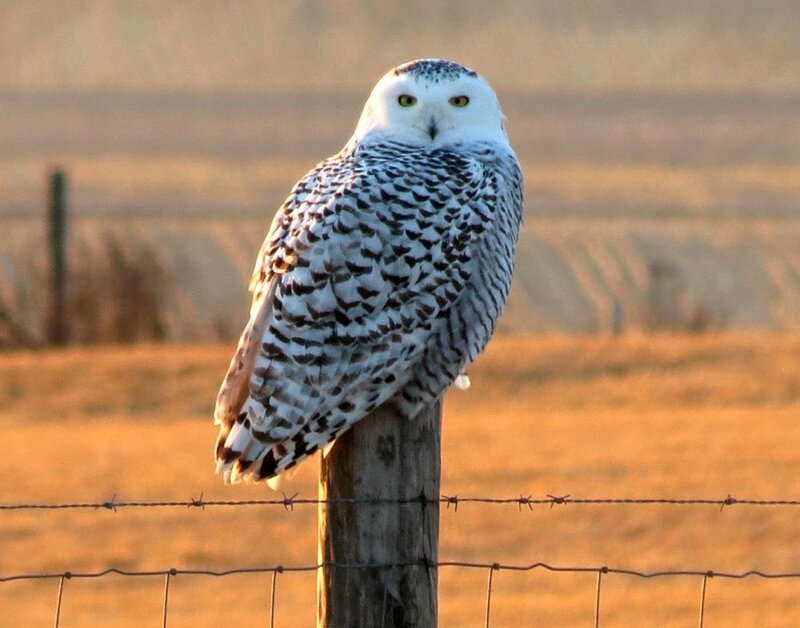 Since the snowy owl at the quarry was now skittish, Gene decided to try his luck with the snowy Mark and Brad found. Gene set up a bow net on adjacent University land and backed up his vehicle just enough so that he could still monitor both the owl and the bow net containing a rock pigeon as bait, in nearly complete darkness. After 20 minutes, the owl attempted one quick pass at the pigeon in the bow net and then returned to a pole nearby. The bow net was packed up and the crew headed to the Kampen Road residence, owl carefully in tow, where it was learned that the other owl at the quarry had also been captured! The first owl finally went for the starlings and his talons got tangled in the trap for just long enough to allow the volunteers to approach and untangle him (and save the starlings). Both owls were young males and each was banded. The first owl was the smaller of the two and named "Quarry". The second was given the name “Arlington”, and was fitted with a solar pack transmitter that will send hourly location GPS data through a cell phone tower to “owl central” on the east coast. By the light of the rising super moon, the owls were both released back into the wild to hunt and enjoy the cold, crisp evening. What a thrill for Maddie and volunteer Gerry Bennicoff who released the owls! Arlington can be tracked on the Project SNOWstorm website. More info on another Wisconsin snowy owl caught and outfitted with a new backpack is available here. We will also be providing updates on the MAS website about our new friend Arlington. If you would like to visit Goose Pond Sanctuary to see Arlington and Quarry with your own eyes, the best time to search is the last hour of daylight. Respect for wildlife and private property is of the utmost importance, however; please do not approach the animals or trespass to get a closer look! Related and sad news came to us this morning (Jan. 12). Two snowy owls within two miles of the place Arlington and his comrade were released, were killed by vehicles. While we are glad neither was Arlington, it is heartbreaking to see such preventable destruction of life. Please drive slowly and cautiously to help care for our magnificent wildlife! NOTE: Neither the starlings nor pigeon were harmed in the traps.